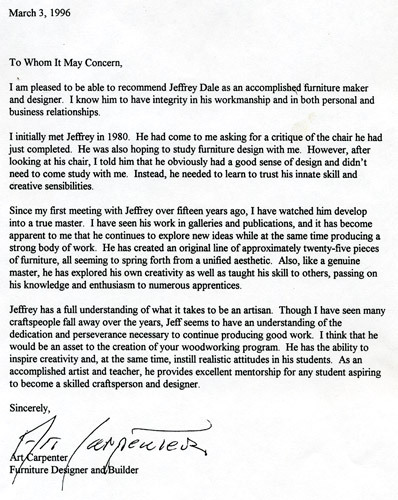 I am pleased to be able to recommend Jeffrey Dale as an accomplished furniture maker and designer. I know him to have integrity in his workmanship and in both personal and business relationships. I initially met Jeffrey in 1980. He had come to me asking for a critique of the chair he had just completed. He was also hoping to study furniture design with me. However, after looking at his chair, I told him that he obviously had a good sense of design and didn't need to come study with me. Instead, he needed to learn to trust his innate skill and creative sensibilities. Since my first meeting with Jeffrey over fifteen years ago, I have watched him develop into a true master. I have seen his work in galleries and publications, and it has become apparent to me that he continues to explore new ideas while at the same time producing a strong body of work. He has created an original line of approximately twenty-five pieces of furniture, all seeming to spring forth from a unified aesthetic. Also, like a genuine master, he has explored his own creativity as well as taught his skill to others, passing on his knowledge and enthusiasm to numerous apprentices. Jeffrey has a full understanding of what it takes to be an artisan. Though I have seen many craftspeople fall away over the years, Jeff seems to have an understanding of the dedication and perseverance necessary to continue producing good work. I think that he would be an asset to the creation of your woodworking program. He has the ability to inspire creativity and, at the same time, instill realisitic attitudes in his students. As an accomplished artist and teacher, he provides excellent mentorship for any student aspiring to become a skilled craftsperson and designer.